Henry Thoby Prinsep (1792-1878), a colonial administrator who reached the highest rank in the East India Company and its successor, the Council of India, published this Code of Practice in 1866: the third edition of 1869, reissued here, was necessitated by new legislation in that year. (Prinsep's earlier work, Origin of the Sikh Power in the Punjab, is also reissued in this series.) 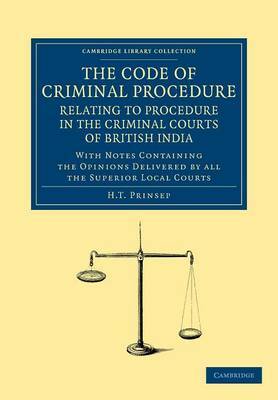 In the preface to this work, written as a guide for local magistrates and administrators, Prinsep states his intent to present, in a convenient form, all the rules of procedure in the criminal courts of British India. Each stage of the process is annotated with explanatory material, and case law and precedents are also cited where appropriate. Appendices contain further relevant legislation, such as rules on extradition and the conduct of the police. An index of cases cited and a general index are also provided.